The big run-up in small cap multifamily prices has abated. Boxwood's Small Multifamily Price Index for assets under $5 million rose to a new high in January, but the slim 0.2% gain was the lowest monthly increase in four years following a similar increase in December. And though these assets generated a healthy 7.5% annual return in January, it prolongs a downward trend of single-digit, annualized price advances that began last August. The pull-back mirrors somewhat softer multifamily space markets, where the national vacancy rate rose for the third quarter in a row according to Reis, Inc. as supply of new apartments has continued to exceed demand. 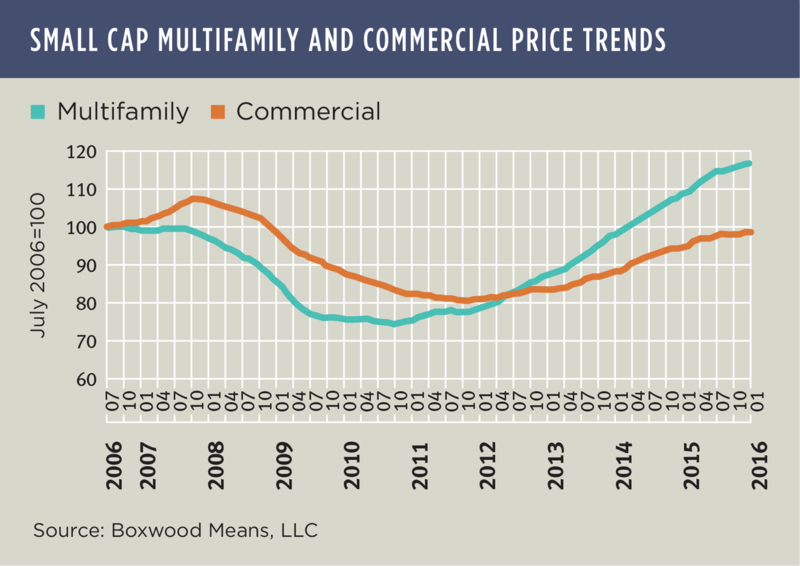 As the nearby graph illustrates, surging investor demand for small multifamily assets produced several years of double-digit price growth that has elevated Boxwood's Index of 48 primary and secondary multifamily markets 16.8% above the previous peak set in 2006. By contrast, Boxwood's commercial price index for the same markets increased by only 3.9% year over year and remains 8.4% below its pre-recession peak. While outsized national price increases for small multifamily assets may be behind us now, we will see some metro areas continue to outperform this year. Portland (15.8%), Dallas (15.4%), San Antonio (14.8%) and West Palm Beach (14.0%) are a few of the cities that produced robust annual returns through January along with evidence of vigorous forward price momentum. Also, let's not forget that generally speaking the demand drivers behind core multifamily market fundamentals are still relatively healthy, and borrowers and investors can still find very favorable small balance financing terms from agency lenders to refinance or acquire these smaller assets. For the latest small cap CRE price trends and more research on this domain, see next month's Small Balance Advocate report on this page.